PayPal's founder finds life on land to be too dry. We all know how well building a city under the ocean worked out for Andrew Ryan. Now, a contemporary billionaire wants to try living on top of it. Peter Thiel, founder of PayPal, investor in Facebook, and self-made billionaire, has decided that life on boring, dry land under a ho-hum, moderate republican government does not suit him. 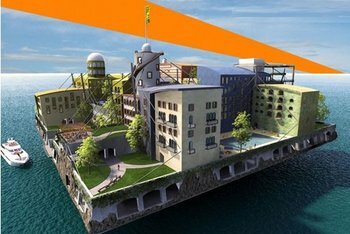 Since the United States has not been especially receptive to Thiel's favored libertarian ideas, he has decided to invest over a million dollars in starting a new life on an artificial island where libertarianism reigns supreme. "There are quite a lot of people who think it's not possible," said Thiel in 2009. According to Details magazine, he then continued, sounding absolutely nothing like a mad dictator: "That's a good thing. We don't need to really worry about those people very much, because since they don't think it's possible they won't take us very seriously. And they will not actually try to stop us until it's too late." Thiel is a supporter of the Seasteading Institute, a non-profit organization founded in 2008. Their mission: "To further the establishment and growth of permanent, autonomous ocean communities, enabling innovation with new political and social system." According to Details, the institute believes that most established governments are too resistant to change, and that true social progress can come about in the lawless waters of the high seas. So far, Thiel has donated almost $2 million to the cause ($1.25 million recently, and $500,000 in 2008), but it seems like an entire floating nation would cost well into the billions. Still, the Seasteading Institute will start small with an office park off the coast of California next year, and more permanent oceanic residences seven years after that. We at The Escapist would like to wish Mr. Thiel the best of luck in his endeavor to flip all terrestrial life on Earth the proverbial bird. Besides, if living atop the ocean doesn't work out, he can always start a new life under the sea.